The only downside is that it can take a while for up-to-date content to make it across to whatever service you subscribe to. However, Popcorn Time has arrived on the scene and this new open source BitTorrent-powered movie streaming app for downloading and watching movies, can probably be best described as Netflix for Pirates or even Torrents for Dummies. 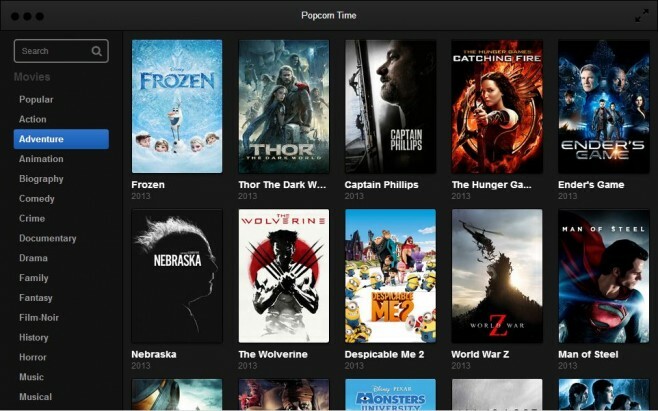 You can access Popcorn Time on Windows, Mac OS X, and Linux. The service also promises zero advertising and an entirely free experience and although you are free to browse the latest movies without bumping into the seedier aspects of the web, that usually frequent the world of torrents, you still need to be aware that behind the glossy welcoming Netflix like screen, you are still putting yourself at risk from the wrath of the Hollywood legal teams who are probably working out a method of scaring people away from the service as I write this. Popcorn Time, for those that live life on the digital edge. The controversial app is officially still in Beta, and will predictably have an uncertain future, but whatever your opinion on viewing entertainment illegally, maybe this is just further evidence of how the industry needs to adapt to the way in way in which we access content and how quickly we expect things. Behold the power of open source software. After the untimely death of the original Popcorn Time, a so-called Netflix for pirated content, the project was forked several times on GitHub. And guess what? It’s back and more shady than ever before. “It’s our vision at YTS that we see through projects like these and that just because they create a little stir in the public, it doesn’t mean they are shut down. The installer and project files are available on GitHub. The new version works just like the previous one. As the release notes say, the new version, build 0.2.7, now uses trakt.tv to pull in additional movie metadata meaning it now has cover images, backdrop images, Synopsis’s and runtime data. The project is being headed up by a developer that has worked on several public builds before, lending a bit of credulence to this new build. All the files for original Popcorn Time was available from the start on GitHub. Anyone could access and build out their own version. After the original shut down, a new group of developers backed by YTS picked up the ball and ran with it. It seems in this case the sequel is more interesting than the original.